Pre-winter landscape maintenance is essential. Although snow will provide the required moisture and insulation to your plants, if your yard is not ready to welcome the freezing winter, it will die. Frost will take its toll and damage the plants, winds can cause drought-stress, and although you cannot struggle with the wrath of nature or have full control over your landscaping during the winter, you can still prepare it before it becomes dormant. When plants enter dormancy, they don’t die, they just take a break from growing. Inside the earth, their roots still need nutrients. They require water, oxygen, and sun in order to grow again in the spring. Plants need dormancy to withstand the freezing weather and temperature fluctuations. Pre-winter and fall property maintenance involve several tasks. To help your garden survive during the winter, you must focus on several areas. Rake tree leaves. If they cover the lawn as a blanket, it will keep it from getting enough sun and moisture. If the leaves rot or have diseases, they will transfer fungal diseases on your lawn too. 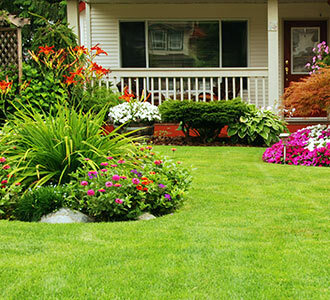 Lawn maintenance is important, and you should ensure it is cleaned, mowed, and fertilized. To help your lawn get the right amount of nutrients, this is the best period for aeration as well. Prune perennials, especially if some parts are diseased. By cutting them back, you can prevent these diseases and keep insects away. Help them stay hydrated by placing mulch all around their base. 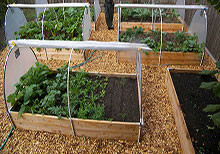 Mulch will protect them from frost and keep them hydrated. Cut tree branches that are long, diseased, or weak. They won’t be able to withstand the weight of snow and might break. It’s also wise to trim bushes and cover leaves with fabric. Remove any sticks and tree leaves from the lawn. Pull out dead annuals and any other diseased plant. Also, clean, sharpen, and store your garden tools for the season. Remove dead leaves and place mulch in plant beds to ensure they get enough moisture. Lawn aeration is important too. Drought is caused by winds as they remove water quicker than the landscape or plants can replace it. This can happen even during the winter since the land is frozen. The ground must be clean so that the snow that will cover it will provide the required moisture. Cover tender plants. You can use glass or fabric to cover the entire plant or just its leaves. If your plants can be moved, take them in a sheltered spot. Make sure they get enough moisture. It’s important to take measures as you can never be sure when the temperatures will drop. Sudden frost and temperature fluctuations between the day sun and chilly nights will harm the plants’ cell walls. Pre-winter garden maintenance will help your lawn and plants survive winter and still flourish again in the spring.